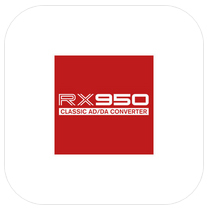 RX950 Classic AD/DA Converter emulates the old Akai S950 sound! Great for Lo Fi House and Hip Hop!! The Input Gain Knob makes your sound loud’n’proud with the S950’s unique grit and warm distortion. It’s powerful and will help anything stand out in your mix. The Audio Bandwidth Knob controls the target sample rate and analog-to-digital conversion circuitry with an exquisite, yet remarkably subtle, aliasing effect. The Filter Knob controls the S950’s infamous steep low-pass filter. Use it on separate elements, or on any output bus or master section. Aleksandar Mlazev released Little Rocker, a new distortion effect to join his growing line of AUv3 effects apps. In addition to the grit you’d expect from a distortion effect, Little Rocker also includes speaker emulation for an extra layer to your sound. Little Rocker is also Universal. Whole guitar sound with innovative distortion effect, speaker simulation and reverb. You can control the speaker simulation mode using a slider. The effect has huge amount of low end and a nice smooth sound. 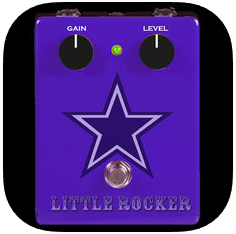 Little Rocker can work as an audio unit effect AUv3 and also as a stand alone app so you will need nothing more than this app and a connection to your guitar to rock hard. The virtual speaker is not a simple impulse response simulation but a complex algorithm adding resonances and multiple phase changes to the signal. – MOD – virtual speaker mode. One of the original buffer effects, and still one of the best, Replicant is essentially a randomized looper/buffer reverse, with a randomized stutter effect inside the loop. From a simple delay or panning effect, on up to massive random “instant Autechre” beat mangling, Replicant is a capable plugin well in line with today’s electronic music styles. Stuttering buffers and filter drops are easy to program, and the comprehensive randomization features give it a mind of its own, if so desired. If you’re looking to add some chance to your production, you’ve come to the right place! Replicant 2 is a tempo-based effect, and requires a host that provides transport information. A standalone application is supplied, but it requires an Inter-App Audio connection to a host with a transport to work. We strongly advise using the (identical) AUv3 instead. Ableton Link will be added in the near future for true standalone operation. Also note that AudioBus 3 does _not_ provide transport information. Hence, Replicant will not work correctly in AudioBus 3. We recommend BeatMaker 3, AUM, Cubasis, ModStep, GarageBand, and similar AUv3 hosts that have a transport. And finally, we have made an iPhone version available for cross-compatibility, but note that the controls are very small. It can be difficult to use in this context, and we do not recommend it. 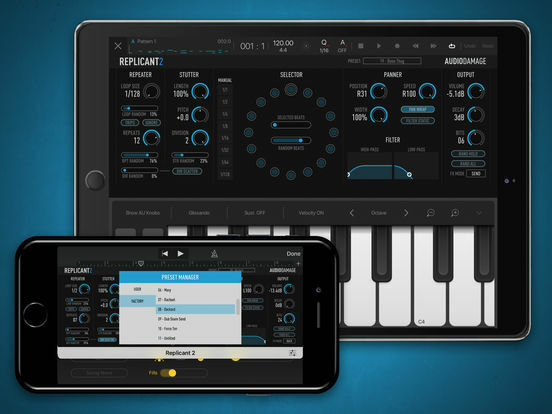 Replicant 2 for iOS is otherwise identical to our Replicant 2 desktop plugin. Visit the Audio Damage website for audio samples, a video overview, and a full manual. 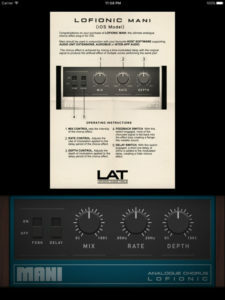 » Tempo-based delay and looping effects, from 1/128th note to an entire measure. » Seven independant randomization controls, for subtle changes or extreme aleatoric madness, including a global randomize button. » Our unique “Hold” feature, to store a random sequence you like. » Resonant low-pass and high-pass filters that change over time. » Pan position that changes over time. » Two separate direction modes, for entire events or individual repeats, with randomization. 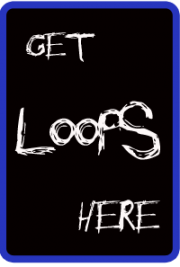 » Front panel triggering of loop events for live playing of effects. Listen to the album “Replicant 2 Demos” by Audio Damage. Lofionic Mani is a rich and evocative analogue-modelled chorus effect for iOS, supporting AudioUnit, Inter-App Audio and AudioBus. In addition to the standard mix, rate and depth controls, Mani adds a switchable feedback control, for metallic flanger-like effects, and a pre-delay switch for extra body.